October 03, 2018, Brussels, Belgium – The Public Protector of the Republic of Zambia Mrs. Caroline Sokoni says her institution has the necessary protection under the Constitution to carry out its functions with independence and integrity. Mrs. Sokoni said the Office of the Public Protector, formerly known as The Office of the Investigator General, is committed to carrying out its mandate and individuals and institutions are free to engage the institution on various matters. 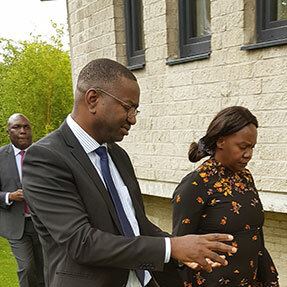 She made the remarks when she paid a courtesy call on Charge d’ Affaires at the Embassy of Zambia in Belgium, Mr. Henry Ngilazi. 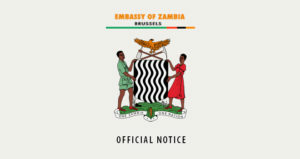 Mrs. Sokoni told the diplomatic staff that the institution changed after His Excellency President Edgar Lungu signed the Constitution Bill number 17 of 2015 which, among other clauses, provides for the existence of the Office of the Public Protector. “This constitutional innovation provides the institution of the Public Protector with the necessary protection required for it to properly carry out the functions of the ombudsman with integrity and independence,” Mrs. Sokoni said. Mrs. Sokoni is currently in Belgium to attend the 20th Anniversary of the Federal Ombudsman of the Kingdom of Belgium. And Mr. Ngilazi reiterated the Mission’s commitment to fostering and enhancing Zambia’s cooperation with the Kingdom of Belgium, Netherlands, Luxembourg and the European Union among others.